Military Charms and Pearls chain bracelet FROM PARIS WITH LOVE! « Back | TopVintage » Accessories » Bracelets » From Paris with Love! » Military Charms and Pearls chain bracelet FROM PARIS WITH LOVE! From Paris with Love! Military Charms and Pearls chain bracelet FROM PARIS WITH LOVE! 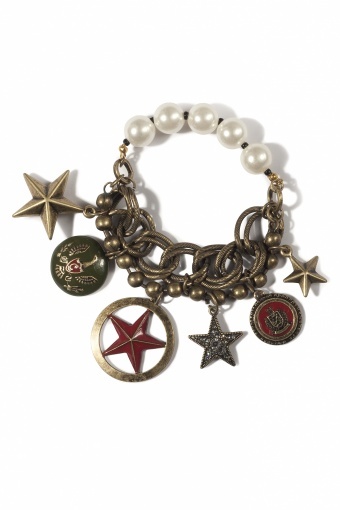 Military Charms and Pearls chain bracelet by From Paris with Love! One of a kind antique bronze tone chain bracelet. The charms are truly special, partial enameled in matching green and red tones and very detailled. On of the star charms is richly covered with a rhinestone and strass. With five pearl beads. Very limited stock!